Medium - $44.99 Only 5 left! Wanted: New face for Gotham City's premiere crime-fighting family. Will assist leader and founder of crime-fighting organization. Must have a keen eye for details, possess a tragic back story, and be able to perform expert acrobatic skills upon command. Computer skills are preferred but not necessary. Must be comfortable working as a team. Schedule must be flexible: Includes long hours and overnights. Must pass background check, pay negotiable after a small probationary period. See Alfred at Wayne Manor for application. Crime fighting outfit must fit specifications described below. If you've got what it takes, please apply today! 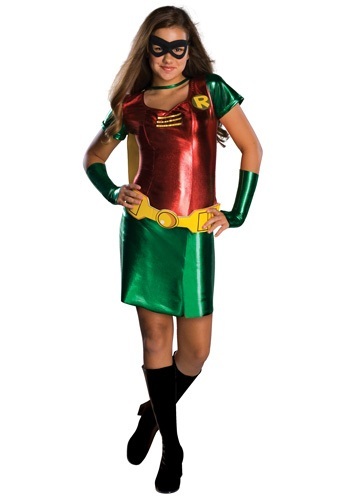 Your Tween Girls Robin Costume must bring the look of the classic comic book together with a cute and contemporary style for girls. Please ensure your outfit is a perfect blend of 92% polyester and 8% spandex. Dress must also have metallic sheen, so as to send a message to the innocent citizens of Gotham City that you are, indeed, a superhero crime fighter. Please ensure outfit consists of the colors red and green, with yellow as an accent color: A red top with green sleeves, a yellow belt, and a green skirt are preferable. We will sew an "R" patch onto the chest of your outfit upon hire, as well as provide metallic green fingerless gloveless, a yellow cap that ties around the neck, and a black foam eye mask that secures comfortably with an elastic band. Please provide your own black knee socks or tights, as well as black shoes or boots that you can run, jump, and scale buildings in.